Today the Senwes Group Christmas Tree project is proud to host 600 children and special needs adults from Manu Dei, Triest Training Centre, Janie Schneider, Rethabile Children’s Home, Viljoenskroon Youth Care, Khaya Tshepo, Daphne-Lee, Voetlig Kinders, House Adonai and the Atamelang Child and Youth Care Centre. The event took place on 2 November 2018 at the Triest Training Centre and saw over 200 Senwes staff volunteers treating the 600 recipients to gifts and personalised care during the day. The event would not be possible without the assistance of sponsorships from more than 80 businesses and individuals in and around Klerksdorp namely; ABSA Bank, Albadawe Distributors, Almur Marais, Ankers Brake & Clutch, Annies Trophies and Engravings, @Office, Bastion, Botle-Ba-Kopano, Breethe, Cadillac Pub Doringkruin, CANSA SA, Cash Crusaders, CC Sports, Certisure, Coca-Cola South Africa Beverages, CSS Security, Curro Klerksdorp, Dante's Pizza, Datacentrix, Degesch, Ebersohn Medical Rescue 24 Pty (Ltd), Ellaton Mining Supplies, Goudkop Slaghuis, Grindrod Travel, Grainovation, Guttera Tours Pretoria, Hervormde Kerk Doringkruin, Hind Shalala, Hinterland, ITR Technology, Jacques Schoeman, James Botha (Senwes director), John Deere, JX Jumping Castles, Kingsley Depot, Klerkscale, Klerksdorp Fire Department, Liberty Life, Liqui-Pure, Matlosana Fire and Rescue Services, MCC Spar, Meyer van Sittert en Kropman, MJ Jump and Slide, National Automative Wholesalers Pty Ltd, Nedgroup Investments Pty Ltd, Nico Liebenburg (Senwes director), Oase Gemeente Church, Orkney Refrigeration, Pest Arrest, PLH Placements, Rent-a-Drum Klerksdorp, RMB, Road Show Entertainment, Rockaberry's, Rozello, Schoonspruit Hoërskool, Senwes Central Admin, Senwes Credit, Senwes Directors, Senwes Equipment, Senwes Grainlink, Senwes Group staff, Senwes Innovation, Senwes Skryfbehoeftes, Simon Mohapi (Senwes director), Sizabantu, Solareff, Spur, Steers, Stilfontein Church in Bucan Street, Stilfontein Primary School, The Talisman Hire Potchefstroom, The Taste, Thys Bruwer, Tom van Rooyen (Senwes director), TipTop Group, TLC Fire, Tradevantage Grain Pty Ltd, Triest Training Centre, Ultra Liquors, Vaal Maseru Transport Services, Wesvalia Hoërskool, Thabo Van Zyl (Senwes director), en WP Tente. From everyone at Senwes - a huge thank you to all the sponsors. However, special thank you also have to go out to the following people: The Senwes Group Exco for allowing us to have this amazing event each year, the heads of the various Senwes businesses who have contributed to the sponsorship of the event, as well as Elmarie Joynt and her team. Neeta Morar and her team and, of-course, all of you - the more than 200 Senwesters who volunteered to make the day so very special. The Christmas Tree event has become an important day on the Senwes calendar. Not only does it provide enormous goodwill to the recipients, it also involves the local community and businesses. 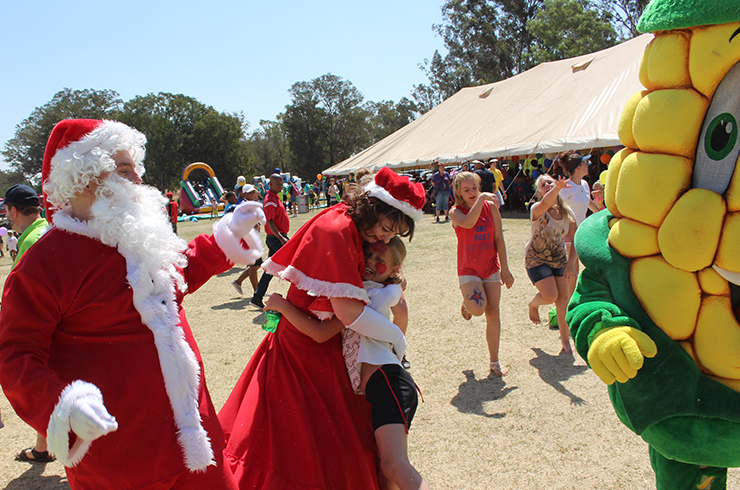 Senwes is very proud to bring festive cheer and joy to everyone involved each year. We look forward to putting smiles on the faces of all concerned again next year!